Have fun with family and friends when you participate in the Great Outdoor Scavenger Hunt! A picture may be worth a thousand words, but an experience is priceless. 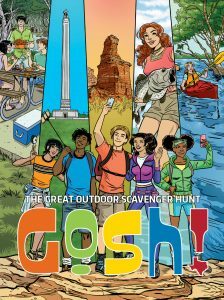 Get your experience on with The Great Outdoor Scavenger Hunt, or GOSH. It’s a fun framework in which to go and see and do. Nathan Adams is art director for TPW Magazine, which is where you will find a list of 30 locations that feature Texas’ natural wonders, history, wildlife, water and fringes. Participation is as easy as taking a selfie. Everyone’s got their phone with the all the time. So, you would go to one of these locations, and there are instructions for what to take a selfie of. We want to see you and we want to see whatever the location is; we want to see that present also. And so you would go to that location and take a picture of yourself. Then upload the images to social media, or to a portal on the website with the hashtag: #GOSHTX. They’ll be added to a gallery where you can see what others are doing. Nathan hopes some friendly competition will arise. I would love it if Texas A & M would challenge UT. Or, Texas State and Texas Tech would get involved. I would hope that this would encourage some competition among people. Yeah. 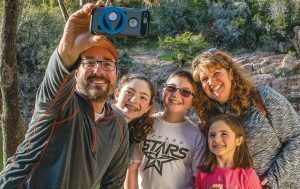 Find complete details for the Great Outdoor Scavenger Hunt in the May issue of TPW magazine—on newsstands now—and the TPW website. No matter where you live in Texas, you can participate in the Great Outdoor Scavenger Hunt. 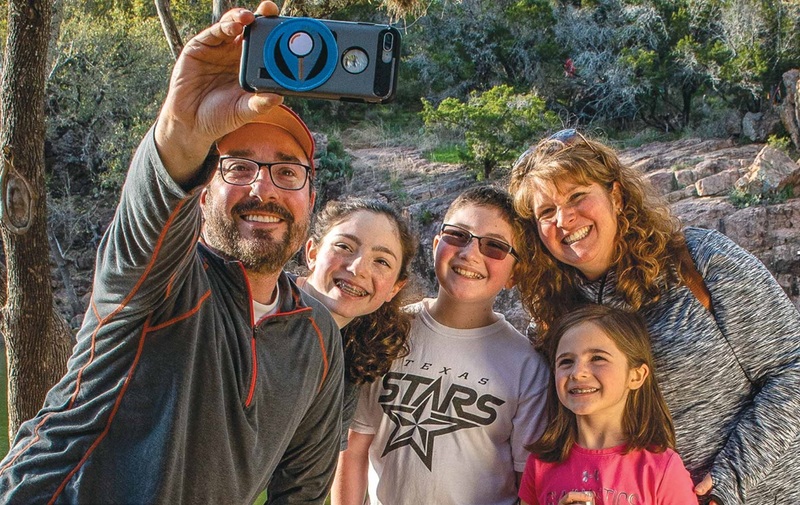 Through Labor Day, The Great Outdoor Scavenger Hunt—or GOSH—inspires you to discover the natural wonders, wildlife, water, history and fringes of Texas. I would want to make sure everyone knows that no matter where in Texas you live, there’s at least one thing on this list that’s close to you. And probably more. So we want everyone to participate. This should not feel exclusive, this should feel very inclusive. Nathan Adams is art director for TPW Magazine; along with the website and magazine APP, it provides the GOSH guide, which includes 30 tasks to encourage exploration and discovery of Texas’ best. If you complete all of the tasks in any given location, then you’ll get a certificate that we’ll email to you that you can print out; and if you’re crazy enough all the way—get them all—then you’ll get a different certificate [you’re a “Gosher” par excellence] and you’ll get a two-year digital subscription to the magazine. 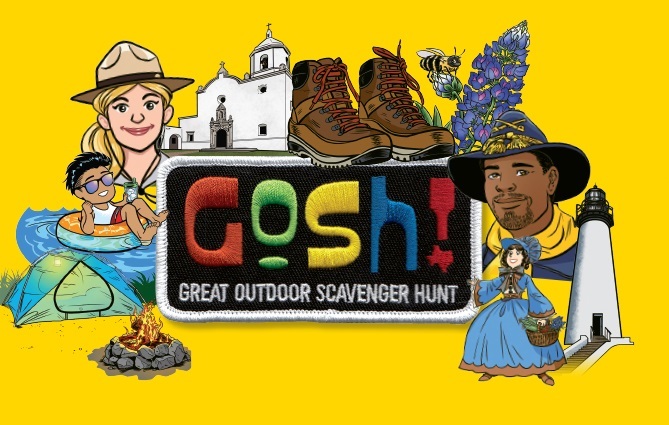 To participate, go to the sites, take selfies of you and your crew and then upload the images to social media, or to a portal on the website with the hashtag: #GOSHTX. So, I’m hoping people will discover things didn’t know existed in Texas. But mostly I’m hoping that people will just have a good time being outdoors. Get the family outside and participate in the Great Outdoor Scavenger Hunt. Is this how summer vacation usually goes at your home? I’m bored. What are we gonna do? Summer vacation’s great for about the first ten days; then it’s drudgery for the next two months. Nathan Adams is art director for TPW Magazine. He says this year will be made different…by G.O.S.H. 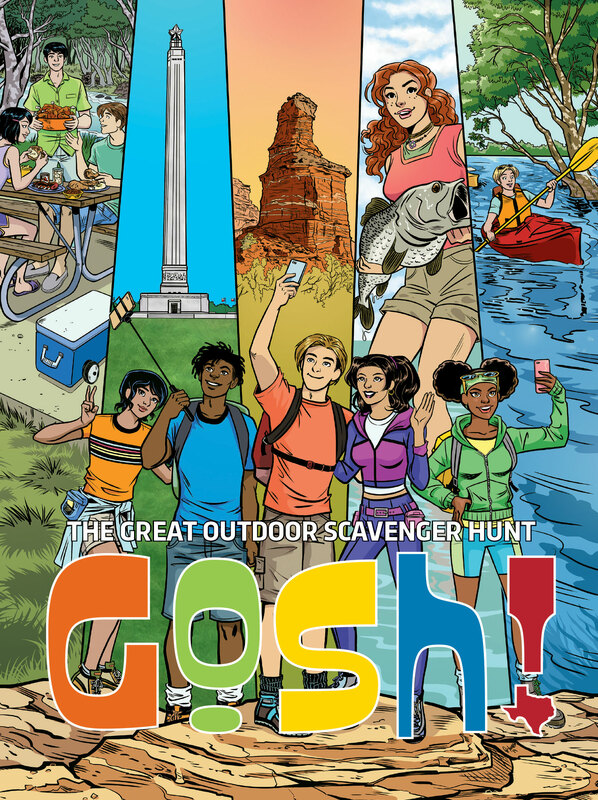 GOSH stands for the Great Outdoor Scavenger Hunt. The May issue of TPW magazine, the website and APP has a list of GOSH locations. Use your smart phone to snap selfies at the sites listed. What makes it unique, in part, is just the size and the scope of the state of Texas. There’s so much out here to see and do. And so, we wanted to find a way to encourage people to experience the history, the nature, the wildlife, the water features—just all of Texas. And, a scavenger hunt—let’s be honest—it’s a gimmick. But it’s a fun framework in which to go and see and do. Instructions for what to include in your selfies are in the magazine, online and in the APP. Upload images to social media, or to a portal on the website with the #GOSHTX. And then we’ll be collating those into a gallery where you can see what other people are doing, or collect what you’re doing, and keep track of your progress, and see how many of these locations you can hit over the summer. Find all details at tpwmagazine.com. Working on a prescribed burn. We welcome rain in Texas as it promotes lush vegetative growth. Yet, in the absence of fire, such growth can become a problem. The lack of fire on the landscape has been a big issue. Especially in East Texas, but across the state. We’re seeing a lot of our habitat go from those grasslands to being more dominated by woody vegetation. Jason Hardin, Turkey Program Leader at Texas Parks and Wildlife, says woody vegetation with an open understory is good turkey habitat. A turkey’s main defense is its eyesight. Its sense of smell isn’t much better than ours; it’s sense of hearing is good—but it’s not going to keep them alive. So, their vision is most critical for them. So, they need to be able to see where they’re going. If they can’t see through it and move through it easily, it’s not good habitat. Fire creates an open understory, which affords usable space for turkey, especially in rainy East Texas. When you see forty, fifty, sixty inches of rainfall a year—you’re going to get a lot of rapid growth on that woody cover. So, burning those forests is essential. 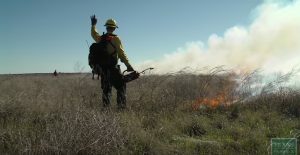 We don’t have a fire culture in Texas; people know it’s important, but they’re scared of it. So, we’re trying to provide funding where we can, and work with partners to try and get fire on the ground with certified prescribed burn bosses doing that fire—some of our staff as well—to educate those landowners. And try to—as much as we can—begin to develop a culture that if they’re not willing to burn it themselves, at least they can support fire as a management tool. A gobbler in its natural habitat. 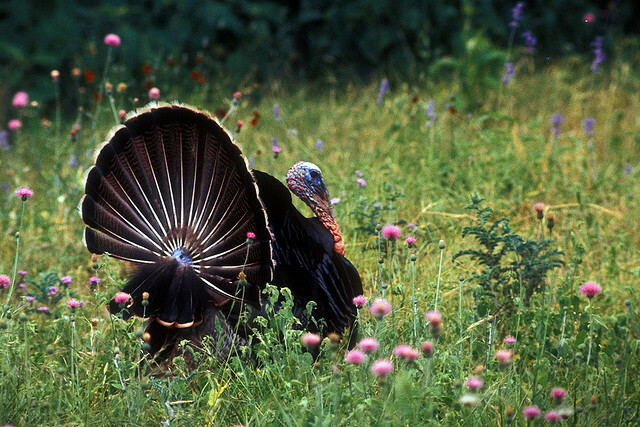 Texas has three sub-species of Turkey: the Rio Grande is the most abundant, followed by the Eastern and then by the Merriam. Without good habitat, none will thrive. They have to have good structural cover. Jason Hardin, Turkey Program Leader at TPW, says this may include low-growing, woody cover for nesting. It provides like an umbrella that they sit underneath to protect from avian predators and then also weather elements. And then also, grasses, weeds, forbes growing up to provide vertical cover. Think of woody cover as you would a deer blind: you can see out, but nothing sees in. This feature is critical when hens are on nests and raising poults. The biggest threat to good turkey recruitment (nest success and poult survival) overall is weather. Because that nesting rate, re-nesting rate, poult survival—all that’s driven essentially by moisture and the climate. So, if we have three years of drought, you’re going to see that Rio Grande type turkey population begin to decline. So, it’s something we try to pay attention to. And over a long term—five ten years—is there something beyond weather that’s causing a shift in that population. In addition, the lack of fire to burn out dense understory growth from an abundance of rain, impacts Eastern turkey habitat. The value of fire when managing habitat—that’s tomorrow.